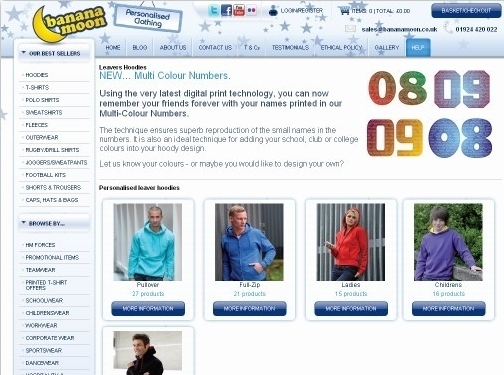 Banana Moon are a personalised clothing company specialising in school leavers hoodies, printed t-shirts and custom hoodies. UK (West Yorkshire) based company offering personalised clothing service and merchandise for sale. Website features e-commerce facilities, personalisation features (e.g. ability to upload your own logo), blog, testimonials, gallery, FAQ, video guides, full company contact details.